The Agatha Christie story of 1939 started with a title and a children’s rhyme that are no longer printable for their racist connotations. The story has ended up being called “And There Were None”. Everyone turns up dead — 9 murdered, 1 suicide. 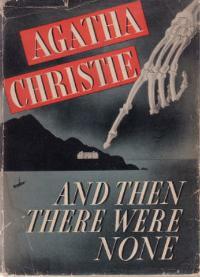 It is the biggest-selling of all Christie’s plots – about 100 million copies sold so far. A year ago, there were 19 Russians with a fortune estimated by Forbes at $9 billion or more. That qualified them in the Forbes top-100 worldwide. At the top was Oleg Deripaska; at the bottom, Alisher Usmanov. In the middle were Vladimir Potanin, Mikhail Prokhorov, and Victor Vekselberg. These men are all stakeholders in Norilsk Nickel (MNOD:LI, GMKN:RU), Russia’s largest hard-rock mining company, and a world leader in production of nickel, copper, platinum group metals, and cobalt. They are also fighting fiercely among themselves for control of the company, whose market capitalization this week is just under $8 billion. At peak last year it was $60 billion. Two of the Russian stakeholders are already facing the law courts of the US and the UK. The outcome of the litigation directly affects the Russians’ credit and risk reputations with their banks; covenants that have been signed, also with the banks; their fitness under UK company law to sit on London listed companies; and their freedom of movement under US, UK and European Union visa regulations. Deripaska is currently before the UK Court of Appeal, attempting to overturn the High Court judgement of last July, requiring him to stand trial for the multi-billion dollar contract violation claim of former partner, Mikhail Chernoy. Deripaska denies the claim. Alisher Usmanov is named with others, including two corporate defendants, in a suit in the Denver district court of Colorado. The De Beers subsidiary, Archangel Diamond Corporation, is suing for the loss of mining rights to a multi-billion dollar diamond deposit in Arkhangelsk region. Usmanov is identified in the court papers as one of the alleged “agents and co-conspirators” in what is charged to have been “a scheme of fraud, breach of express and implied contract, civil conspiracy, intentional interference with contract, breach of fiduciary duty, and unjust enrichment..” Usmanov has said he is not a defendant in the case, and that he is innocent of the wrongful claims laid at his door. A case conference is scheduled with the judge in the case on February 19. A third, Mikhail Prokhorov, is about to face investigation by the UK regulator the Financial Services Authority (FSA). That’s a story that must wait for the telling. In the Moscow battle for Norilsk Nickel, Deripaska’s takeover bid has been neutralized by Kremlin intervention, and he himself is now facing takeover moves by his co-shareholders against his 56.8% control stake of United Company Rusal, the bauxite, alumina and aluminium group. In his place, Usmanov has proposed a takeover of Norilsk Nickel of his own. A partial scheme was leaked to a Moscow newspaper this week, which suggests that Usmanov proposes to value his Metalloinvest holding of iron-ore mines and steelmills at half of Norilsk Nickel’s value. In return for a 37% stake in Norilsk Nickel, he is proposing to merge his assets, plus his stake in the yet to be developed Udokan copper deposit in southeastern Siberia; Metalloinvest won a state auction for the mine right last year, allied with a state conglomerate called Russian Technologies, headed by Sergei Chemezov. Usmanov’s scheme would turn him into the single largest stakeholder in Norilsk Nickel, reducing Potanin to 16.6%. In return for liquidating Usmanov’s debts, along with Potanin’s, the state in this scheme would take 25% plus one share. Deripaska’s Rusal, which currently owns a 25% stake in Norilsk Nickel, would either retain it, or lose it in a buyout arrangement with the state, which is currently holding the shareholding as collateral for a loan to Rusal of $4.5 billion. With between $16 billion and $17 billion in debt, Rusal is up for sale, Deripaska has publicly acknowledged. Usmanov’s bid represents a revaluation of his own assets, and is an attempt to fight off Potanin’s scheme, which was placed in the Moscow newspapers on January 19. That plan, verified with Interros, Potanin’s holding, would assign Potanin an 11% stake in the new Norilsk Nickel, but with de facto management control, while the state takes a 25%, also through Chemezov. Usmanov’s Metalloinvest would be downgraded to a 9% stake, equal in size to the controlling equity of the Evraz steel group, owned by Roman Abramovich and Alexander Abramov, which Potanin proposes to absorb in return for state liquidation of Evraz’s debts. Abramovich and Abramov have publicly dissociated their interests from Potanin’s scheme, and Usmanov’s new plan avoids them. A four-cornered deal, in which Potanin, Prokhorov and Deripaska combine with Suleiman Kerimov — another of the oligarchs listed by Forbes — has also been discussed, according to those involved. This would neutralize Usmanov by ousting Deripaska and cancelling his debt to Prokhorov; generating a one-time cash payment to Prokhorov; and increasing Prokhorov’s and Potanin’s stakes in Rusal. Consummating this arrangement is unlikely, however, for Potanin, Prokhorov and Deripaska are so unfond of each other, they find it difficult to speak, and impossible to trust. In this game of each against each, all against all, it is also proving difficult politically for President Dmitry Medvedev and Prime Minister Vladimir Putin to reach an accommodation themselves, and make the required Kremlin decision on how the reorganization of Russia’s mining and metal assets should be implemented. They have delegated negotiations to deputy prime ministers Igor Shuvalov (for Medvedev) and Igor Sechin (for Putin). Sechin has been favouring the combination of Potanin, Prokhorov, and Kerimov. Shuvalov has been favouring Usmanov; he declared at a bankers’ conference this week that he wouldn’t have made the state loan last November that rescued Rusal’s 25% stake in Norilsk Nickel from forfeit to an international banking consortium led by Merrill Lynch. If that was a jab at Sechin, retaliation against Shuvalov is sure to follow. The one certainty in these plots is that Norilsk Nickel’s market value is being heavily discounted. Between November 1 and now, Norilsk Nickel’s market capitalization has fallen from $18.6 billion to $7.8 billion; that’s a decline of 58%, or almost $11 billion. Over the same three-month period, however, the price of nickel has dropped by just 7%. The aggregate index of the Russian Trading System (RTS) has declined by 36%. It is plain that the share price of Norilsk Nickel has now decoupled from nickel, the closest correlate of the share price in the past; and from the trend of the Moscow stock market as a whole. The share price trajectory of non-Russian nickel producers can be compared with Norilsk Nickel’s over the same interval. Xstrata (XTA:LN), which produces nickel, copper and cobalt, along with coal, zinc and other alloys, is the fourth largest miner of nickel in the world. Its share price is down 28% since November last. The Canadian nickel junior, FNX Mining (FNX:TSX), has moved down by 7% in near-perfect alignment with commodity nickel. By contrast, First Nickel Ltd ((FNI:CN), another Canadian junior miner, has increased in value over the same period by 23%. International Nickel Indonesia (INCO: is up 20%. Usmanov’s attempt to revive combat against Potanin, and Deripaska’s earlier attempt, are contributing to the pressure on Norilsk Nickel’s share price. Had Norilsk Nickel followed nickel down, its market cap would have lost $1.3 billion over the past three months; that is $9.5 billion less than it has. Had Norilsk Nickel followed the RTS downward, the value lost would be about $6.7 billion — $3 billion less damage. Sources close to Metalloinvest told Minesite that the net debt position of the holding is “around $5 billion”, half of which is owed to foreign ban ks, and the other half to Russian banks; 70% of this debt is reported to be repayable over three years or more. At present, Usmanov is holding a stake of “around 5%” of Norilsk Nickel. Asked how Usmanov thinks the value of Norilsk Nickel shares may have been affected by the market perception of hostile takeovers and oligarch conflict, the sources said they have no comment. Asked also how they believe Usmanov’s proposal may allay the market concern, the sources declined to comment.